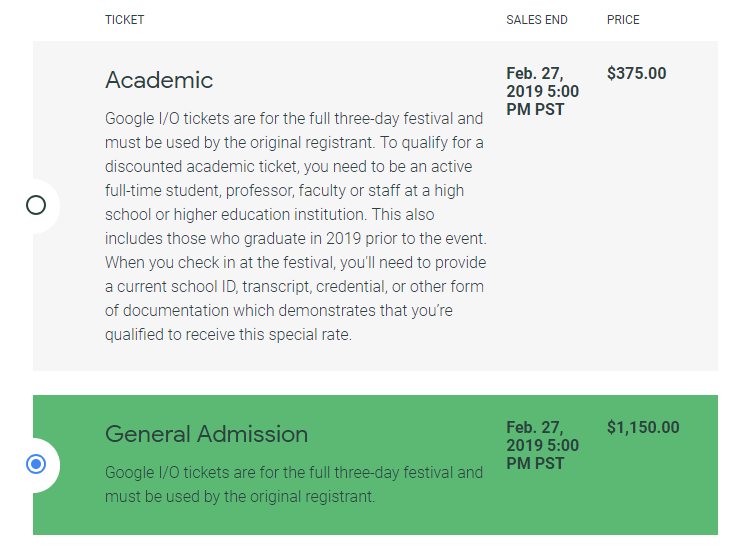 The pearly gates of Google’s I/O 2019 registration are open. The event takes place in May (7th to 9th), however if you intend to attend, you’ll need to pre-register for one of the general admission tickets at $1,150. Parting with a stack as large as this is easy! All you have to do is register for a place in the random drawing on the registration site. You have until February 27th at 5PM PST (8PM ET / 2AM GMT) to apply, and tickets will be dispatched the following day. A valid payment method is required at the point of registration however your card won’t actually be charged unless you secure yourself a place. Nonetheless, it might be a good idea to use a credit card rather than a debit. You know, if you’re worried about the cash being held for the next week or so. It’s a cool $1,150 for General Admission, but Academic applicants can attend for just $375, only full-time students, professors, faculty, or staff at institutions of high school-level and higher need apply for the discounted tickets. You’ll need a Google account/Gmail address to register, and you can only apply once per person. The somewhat simple and standard application process requires some basic demographic and logistical information. You’ll also need to submit a passport style photo for your BLE-powered badge. If you’re interested in joining the rather pricey seat lottery, get your card ready and click the link below.